Are we there yet? Invest in your stress! Home||Uncategorised||Are we there yet? Invest in your stress! 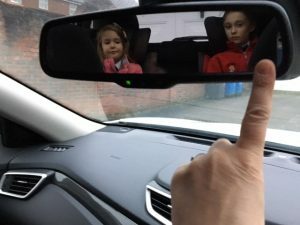 We all dread those long journeys especially if we’ve got young passengers on board and it’s really tempting to download a film, or let them watch a DVD to keep them occupied. Although there is only so many times you can listen to the theme tune from Peppa Pig before you start to fantasize about bacon sandwiches! Travelling is stressful, so if you do have to regularly travel long distances consider a comfortable car seat for your children. How would you like to be strapped to a dining room chair for 2 hours and not allowed to move? No, me neither. But that’s how uncomfortable some child seats can be without good support and padding, so invest in your stress and pick something which offers them the armchair approach, as well as keeping them safe. Now you’re sitting comfortably, I can begin…. Here are some of our travel tips and activities just to break the boredom and help reduce your stress levels. Play a game – You can find lots of games on parenting websites, so we won’t go over it all again, apart from to make two suggestions from our family’s trips. A big favourite in our car is one we call “Before we get there!” you simply each choose a vehicle type: cement mixer, car transporter, motorbike, caravan and so on and count how many pass you in the opposite direction. Our rules are easy the vehicle has to be moving (learnt from experience when passing a camp site!) and no one can choose to count cars, as that would be completely unfair. An Eye Spy for younger children can be played easily by saying “Eye spy with my little eye something the colour of…” although it is quiet funny to play when they spell words phonetically as well! If your super organised (unlike me!) bag up treats separately so they don’t get travel sick in the first two miles from eating and drinking everything as soon as they set off. You can then use delay tactics to spread out the snacking. If we are playing “Before we get there” I use them as rewards for getting 10 motorbikes. If your car or your children’s car seats have cup holders – use one of them as a dust bin, place a nappy bag into it and they can fill it up and remove it easily at the end of the journey. That way they aren’t arguing over each other’s mess and you don’t need to get stressed about the mess. even a blanket for Teddy. Finally, how about this for trick for explaining how much further you have to travel. We love this especially if your children are like ours and have no concept of distance. 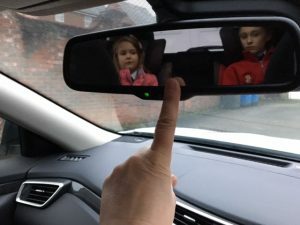 Using your rear view mirror as a time line, explain to the passengers that the far left hand side is home, the far right is our destination and then if you are ½ way there, place your finger in the middle of the mirror, if your ¾ of the way there place you finger ¾ of the way along the mirror. That way they can understand how much time to go based on the amount of time they have already been in the car. If it’s easier you can also introduce where lunch stops will be on the time line. We also listen to a lot of music in our car, so I often say we have about 6 more songs to go – based on the average pop song being about 5 minutes long, making our journey time half an hour. Obviously if you are a playing nursery sing-a-long CD this could be traumatic to older passengers, so use this tip wisely. Hope our tips have been helpful – and remember to follow us on facebook and twitter !